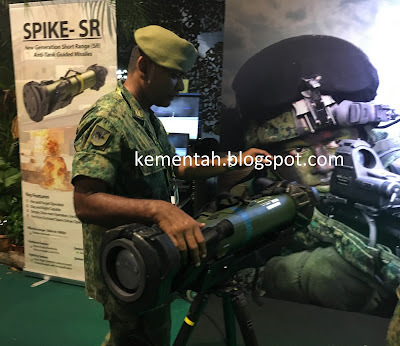 Lethal weapon: A RAFAEL Spike-SR missile, mounted on a tripod and connected to a simulator, was unveiled for the first time at the Singapore Army Open House 2017, which was organised by Headquarters 6th Combined Arms Division. The Singapore Army has introduced the Rafael Spike-SR (short-range) as the new generation anti-tank guided missile for its infantry battalions. The Spike-SR made its public debut at the Singapore Infantry's display at the just-concluded Army Open House 2017 (27-29 May 2017). Issued at Company level, the Spike-SR has replaced the long-serving (and lethal) Carl Gustav 84mm recoilless rifle (RR) as a Company support weapon. In a Singapore Army infantry battalion, the Spike-SR complements the MATADOR (Manportable Anti-Tank Anti-DOoR). The single-shot, 90mm MATADOR is issued at a scale of two tubes per seven person section. Designed with a launch-and-leave capability, the Spike-SR is said to give anti-tank gunners the ability to reach out and touch something up to 1km away. However, the quoted maximum effective range for the weapon, according to open source reports, is said to be 1,500m. Minimum engagement range is said to be 50m - the length of an Olympic-length pool. Training of Spike-SR operators is augmented by a desktop simulator. This presents the image seen by gunners in the weapon's thermal sight (white/black hot options) and can be programmed with tactical scenarios that call for operators to work as an integrated fire team by recognising a threat vector and commanding the appropriate response/firing solution. 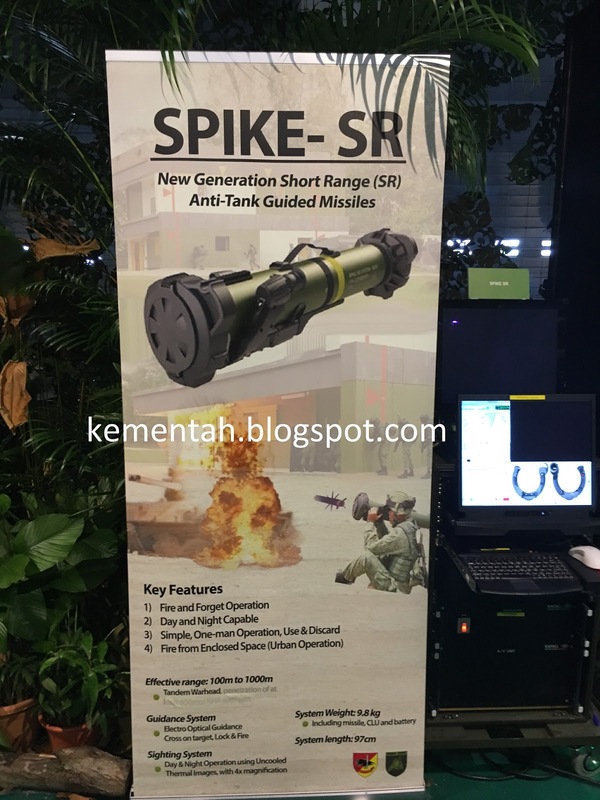 At the Spike-SR display, Senang Diri experienced a mock engagement of an MBT using this weapon. Digits on the left hand controlled the zoom function for the thermal sight. The right hand was used to initiate lock-on while the thumb was used to depress the firing button. Guided by an instructor, the simulated tank target several hundred metres away was destroyed at the first attempt. According to some reports, the missile is able to engage static or moving targets. A variety of warhead types can be used to optimise the blast effect on targets. Weighing just 200 grams shy of 10kg, the Spike-SR is not a handy weapon. The Carl Gustav 84mm RR is heavier, weighing in at around 15kgs unloaded lighter at about 8.5 kgs empty [Note: The 8.5kg weight refers to the M3 model of the 84. The one used by the SAF weighed around 15kg. The sentence has been amended accordingly.]. Each "84" launcher must be served by two operators - firer and loader - whereas the Spike-SR is essentially a single operator weapon. This crew size does not include the detachment commander, who would usually perform range finding and IFF functions to avoid blue-on-blue encounters. In addition to the launcher's weight, fire teams must also carry 84mm rounds, each of which weighs upwards of 3kgs per round. The Spike-SR accords a precision fire capability to AT teams to an Infantry COY. However, the merits of a precise, single-shot weapon (Spike-SR) versus a less-accurate weapon (84mm RR) that nonetheless packs a lethal punch where the rounds land (not to mention the versatility of the RR with the wide range of munitions available) is likely to provide fodder for spirited debates among military buffs. Spike-SR is one of a number of Spike missile variants fielded by the Singapore Armed Forces (SAF). Misunderstanding about Carl Gustav 84mm weight, the weight quoted is for the M3 version. SAF fielded the older M2 version, which weighs in between 14-16Kg, dependent on other stuff, carried along wit the gun. 84MM has it advantages, as it was issued at the Platoon level, but the backblast and the weight of the gun, restrict its emplacement. Rightly so, SAF military buffs bemoan the retirement of the Carl Gustav 84 as it was an extremely versatile & effective company support weapon. In the 1990s each SAF infantry company had 4 CG84s, giving the battalion a total of 12 CG84s. That was a lot of firepower ! Then the infantry soldier could reach out to 700 m with the air burst round. This was very deadly against troops in the open. Also armor could be engaged at about 300 m.
Smoke and illumination rounds were also available. With technological advancements, most of the cons of the older CG84 versions have been addressed. The latest M4 version weighs in at only 6.7 kg with an overall length of 1m. With an additional intelligent sight weighing in at about 1.5 to 2 kg and 3 kg round, in firing condition the CG84 is slightly heavier than the Spike SR.
Also, very significantly, new rounds have been developed. Some new rounds can be used in enclosed spaces with insignificant back blast. More new rounds for use in enclosed spaces are being developed. A "dumb" round is much cheaper than a missile. However the rifled CG84 with an advanced sighting system gives very high accuracy even at ranges of up to 500 to 600 m. Only point targets such as tank/armor need pinpoint accuracy at these type of ranges. The hitting power and high accuracy of the CG84 combined with a wide range of effective rounds continues to make it an excellent support weapon. A new Ultra Light Missile for the CG84 with range of up to 2 km is also being developed. I believe that the Spike SR delivered to the SAF is the anti tank / armor version. A new penetration blast fragmentation version was just developed recently - see Janes International Defence Review July 2016. If employed aggressively & creatively I believe that the Spike SR is a game changer giving small infantry tank / armor hunting teams ( and even an individual soldier ) the ability to neutralize tanks / armor at long range with one shot one kill. My view is that since the Spike SR is currently a purely an anti tank / armor weapon, it shud be complemented with the CG84 and specifically the M4 version. Although a two man team is required for the CG, a well trained team ( similarly for the RPG-7 ) can throw out a lot more firepower than single shot weapon. A highly accurate and perhaps not pinpoint accurate M4 CG84 is more than enough for normal infantry non-anti-armor operations. Anti tank/armor operations should be left for the Spike SR to deal with. while the M4 CG84 should be brought back to SAF infantry battalions. This complementary set of weapons systems will bring back the firepower sorely needed for the SAF infantry company. A scale of 2 M4 CG4s to a company will probably suffice. The CG84 has a lot more range, power and accuracy than a RPG-7. Well said specatgr1, very well explained, my earlier post was debunk and said it would be a zoo if we added another type of system. Well my wishes is that SAF have that added firepower section/company or battalion level. Air burst round for anti-personnel will be lacking in this weapon load out. It is clear that a networked SAF gives it an edge over less advanced armed forces. But it's also it's Archille's heel. I am sure that an enemy will already have plans & resources to try to disable or at least disrupt its effectiveness in times of conflict. Even in a non networked scenario when in training and in real wars it is commonplace to have lack or disruption of communications at the least opportune time. SAF infantry shud also train hard for scenarios where networked assets are not available. A networked SAF enhances the killing power of its weapons. Networks will enable the timeliness & effectiveness of NON INFANTRY BATTALION assets such as MLRS, long range artillery, air support etc in a firefight. But in my opinion there is no substitute for organic platoon / company / battalion support weapons. The SAF infantry platoon / company now has only any anti armor ( Spike SR, Matador ) and anti structure ( Matador ) support weapons in addition to GPMGs. Weapons overmatch is crucial to win a firefight against any opposition which has many more infantry support weapons such as CG84s, RPG-7s, multiround grenade launchers, 60 mm mortars etc. be brought to bear on a target. I am sure that against a highly networked army, the tactic is for the enemy to close quickly with overwhelming firepower especially against a less well armed networked infantry opponent. Historically, these types of tactics have been used frequently & successfully. What happened to matador? Retired? I think this is a great move in the right direction. The CG-84RR is too heavy and cumbersome and the extremely long back blast severely limits potential deployment grounds. My experience with the CG84RR is that the accuracy is questionable when fire beyond 500m and that the movement of the trooper carrying the weapon is slower than the rest of the company. Besides, if one of the crew is invalidated due to combat casualty, then the weapon becomes useless. No point carrying a much heavier weapon when your confidence in hitting the target comes into question. Spike SR gives a lone SAF infantryman the ability to kill armor out to 1.5 km with a very high probability - also no back blast, fire & forget. A formidable weapon indeed. But it is a single purpose ( antiarmor )one shot weapon. It is not light and weighs only slightly less than a M4 CG84 complete with round and intelligent sight. From Youtube videos, Spike SR does not appear to be a top attack weapon. With only Matadors & Spike SR ( both of which are not anti personnel weapons ), SAF rifle companies, platoons & sections are left only with SAWs, outdated 40 mm ULGL M203s & GPMGs for the firefight.